5) You could make them into a wind chime. (No photo available). 6. 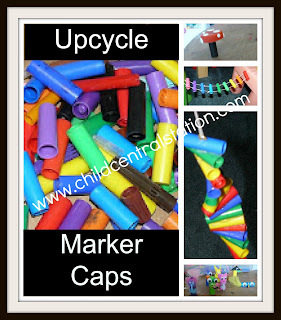 You can use them as small manipulatives to count, sort, and make patterns with. (No photo available). 7) You could use them as playing pieces in your own homemade board game. (No photo available). 8) You could put them on a wire and glue them in place to make a twirling whirly-gig. 9) You could top them with a lid from a milk jug to make tiny tables or toadstools. 10) You could make them into pinky puppets- (they work on all kinds of little fingers, but mostly just on the pinkies of adults). What will you do with your marker caps????? I'm sure you mean aside from stepping on them? I'm thinking dollhouse table. Those finger puppets are awesome! For kids starting to read, you can write letters on them and have them spell the words on their fingers. I have marker tops in my Pre-K class and the kids always put them on their fingers in AB patterns. I save every marker cap, but all I've ever thought to do with them is put them in our glue collage box. These are great! Thanks. I like putting mine to our wooden block area, where the kids add them to their buildings. They are also good for patterning games. By the way, you should also save the dried up markers. 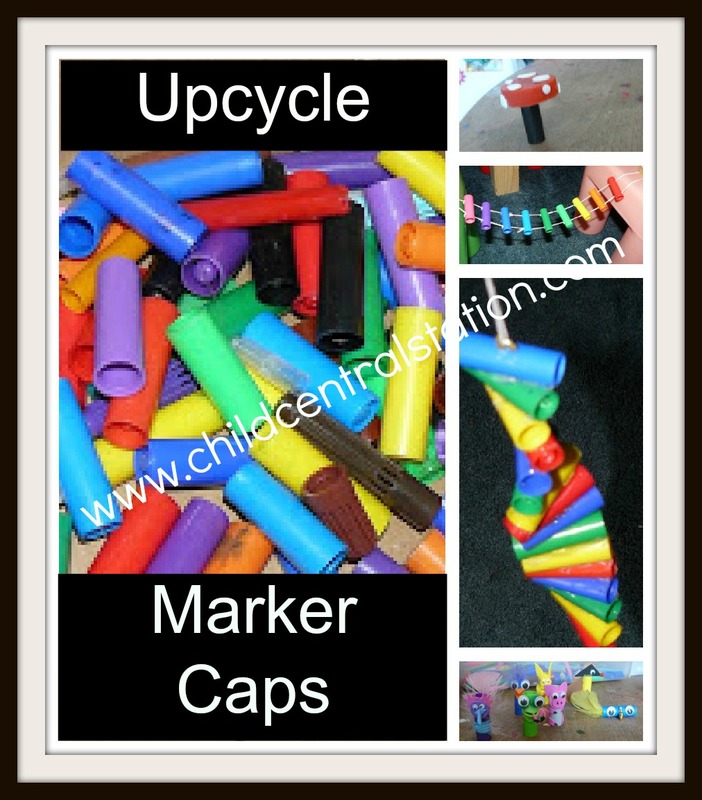 You can pull the bottoms off, rescue the insides and put the column of color in glue bottles. In a couple of days, sometimes a week, you'll have colored glue. There's still a lot of color in there. @ Barbara- I'll add that idea for the markers to the bottom of my previous post: http://childcentralstation.blogspot.com/2010/08/markers-dont-work.html I do save EVERYTHING - or so it seems :). I've always added a little paint to my glue, but I never thought about adding the inside of a marker. Great Idea! @Marlaina- Thanks for the idea with the letters, I'd never thought about that aspect. @Everyone- Thanks, We can get pretty creative around here with what to do with "junk." I'd love to see your creations if/when you bring out the marker caps. It is amazing what the little ones come up with once they start to envision what an object could be. These are great ideas. I also use marker lids for game pieces for homemade board games. What great ideas!! Now can you help think of things to do with play doh tops?? All I can think of is sorting activities. Thanks! Those pinky puppets are so stinkin' cute! I just love this idea - reusing materials is so important to me and these ideas are so creative! I am an art teacher, too, and my students use them for dipping in paint and printing circles with them.